It’s so exciting to see the trendy foodie scene of London making its way south of the river and further east. At least, it’s exciting for me, as I live in South East London. We’ve been relatively lucky to have some real stars already, my favourite having been Brockley Market. This market has been going several years and it is here that you will find some real gems like Mother Flipper, my favourite burgers in London. Hix’s Fish Dog, the Roadery and Spit and Roast, not to mention a lot of great produce to take home. That’s great for lunch, but the night scene was always a little bit quiet in my neck of the woods. A year Mago, my favourite street food concept, Street Feast decided to venture to Lewisham and setup the Model Market. Self-described as “London’s nomadic street food circus”, this concept is really where it’s at when it comes to the leading edge food trends. 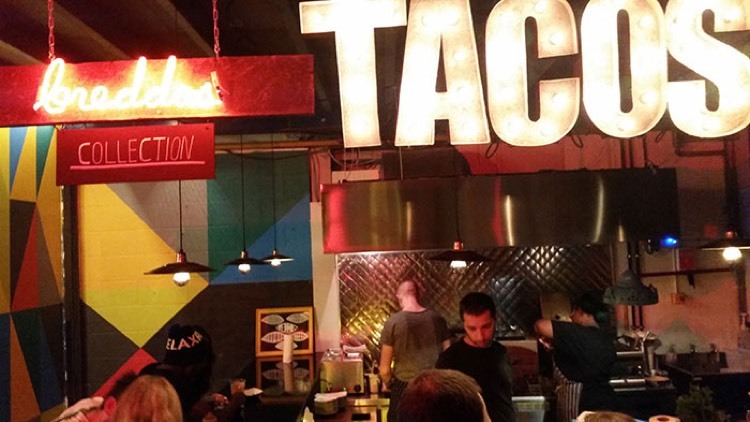 What you will find is up to 20 street food vendors, as well as pop up bars, in funky, informal settings on Friday and Saturday nights in several locations across London. They have a rotating line up, so you will not get bored of the variety, and the food is some of the best you will find in London. I’m not going to harp on about how these guys focus on quality rather than quantity, as I’ve done that enough in previous blogs, but I can’t emphasize enough how good these guys are. Model Market in Lewisham was such a success in 2014 during its 14 week run that it returned this year for a 25 week run and I hear it’s on the cards for a repeat next year. Model Market closed its doors on the 3rd of October, but don’t despair South East Londoners, they have set up a new Street Feast in Canada Water and it’s the biggest and best one they’ve done so far. It’s called Hawker House and features a rotation of 14 street food traders and 8 pop up bars from their ever growing roster of more than 50 vendors. My old favourites Breddos Tacos and Smokestak are there, who are cooking the best tacos and BBQ I’ve had since leaving Texas. I always have to get food from both of these guys whenever and wherever I see them. I also had the chance to try several vendors for the first time. Meat Hook was an impressive new entry with a slow smoked Picanha rump steak with beef fat chips, a beer and bone marrow gravy and a side of chimichurri. The meat was cooked to perfection, the flavours were all in balance, which is harder than it sounds for so many bold flavours, and it was carved to absolute perfection. A fun new one for me was the Meringue Girls who, ironically, were sold out of meringue by the time we got to dessert. They still knocked it out of the park anyway with their signature Cookie-Muff, which is exactly what it sounds like… a cross between a cookie and muffin, served with ice cream and a toffee sugar shard. We were celebrating a friend’s birthday and the venue did not disappoint. The bar concepts were particularly fun. Camden Brewery has a beer van with a good selection of their beers dispensing from taps right on the side of the van. The Can Hatch has a huge selection of imported cans of craft beers and lagers. Street Vin has some very well priced, delicious reds to warm your spirits. We found ourselves at the imaginatively named Whisky Bar. You’ll never guess what they serve there! It’s not the name that drew us in, it’s the selection of 50 Whiskies from around the world and some fantastic signature, whisky based cocktails. They have setup a great concept called Whisky Roulette; you pay £8 for a spin and will get one of the 50 whiskies on their list. Only about 10 are priced at £8 or less, so you’re odds are pretty good on getting an upgrade by playing the game. My friend played three times and drew two drams worth £21 each and one worth £17, so he got £59 worth of whisky for £24! Inspired by his good luck, I played twice, two £6 drams and that’s why I don’t live in Vegas. My poor luck aside, I had a great time, as I always do at Street Feast. I encourage everyone to support these courageous, trail blazers of the London food scene. If you can’t make it to Lewisham or Canada Water, have a look at their website or social media feeds. There are about 4 or 5 Street Feasts going on at any one time at various locations around London, so you’ve got a good chance of finding one near you. And bring friends, as you’ll want to try as much food as possible.